Welcome to the Little Dreams Collection ETHNIC Painting Tutorial! 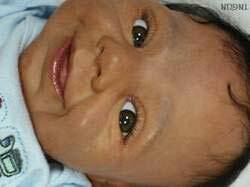 Painting an Ethnic toned baby can be a real challenge especially if you are starting with a new type of paint AND a Caucasian doll kit as I am here in this tutorial. 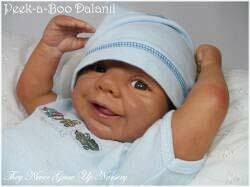 This is the first Ethnic toned baby I have created with the LDC paints. I am learning as I go just as you will. 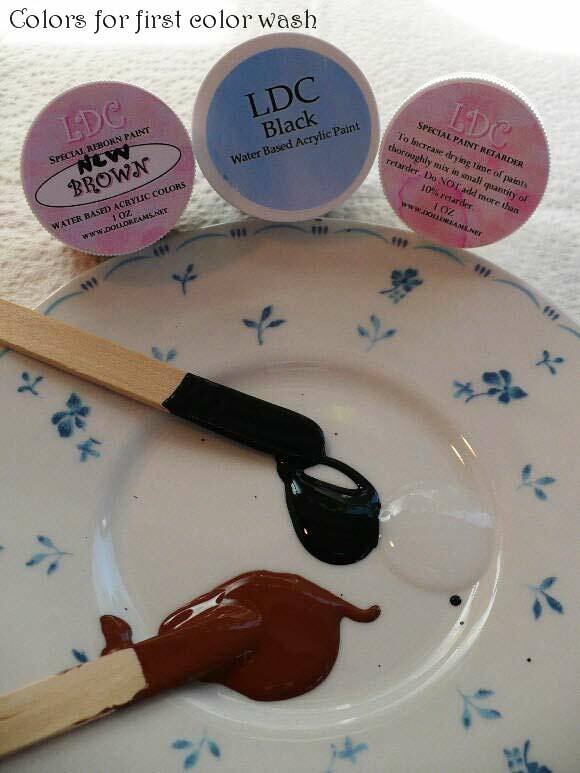 Please feel free to share any tips, suggestions and comments on your use of the LDC paints for painting Ethnic toned babies. For now, please use and enjoy the steps I took to create my first LDC Ethnic toned baby! 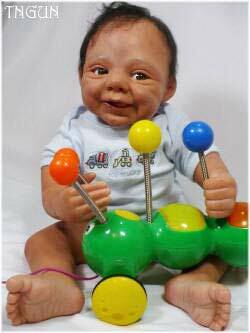 As I mentioned, I am starting out my Ethnic baby with a Caucasian kit. 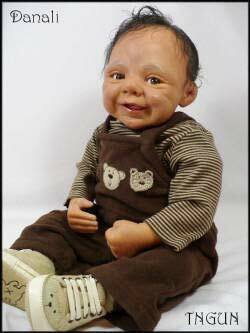 I chose the “Ginny” LDC doll kit sculpted by Elisabeth Steger. 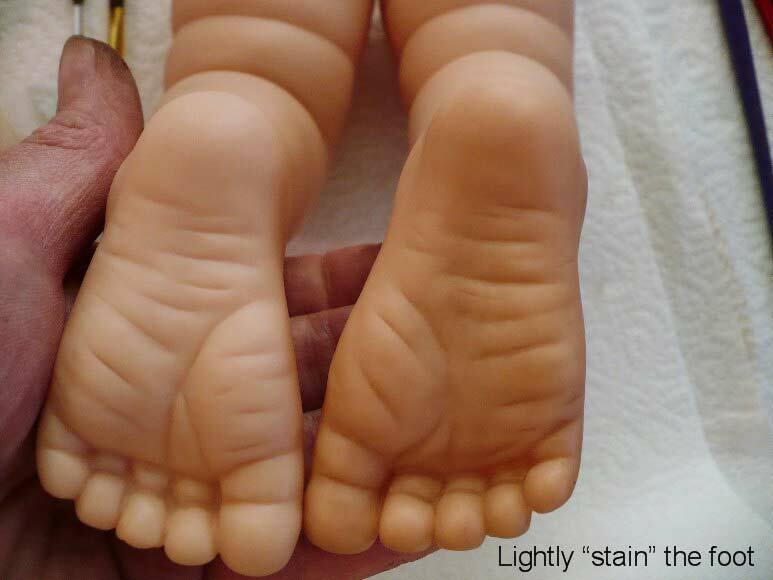 Please refer back to the LDC Painting Tutorial at the top of this page for the basic information on preparing your doll kit for painting, painting techniques and using the LDC paints. Be sure to add retarder, Matte Base and water to all color blends. For the first color wash of color in the Ethnic tone, mix these colors: a bit of Black,a bunch of New Brown, a touch of Red, a fair heap of Flesh and a good amount of retarder, Matte Base and water. 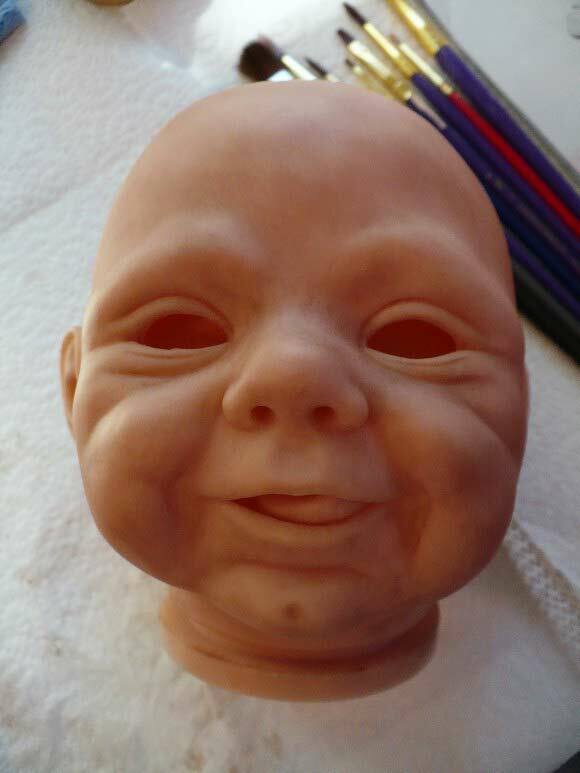 Always try out your colors on the head of your doll so that if they are not how you want them, they will be inconspicuous. Notice how the paint is slowly receding from the side of the plate in a solid sheet. This paint is the perfect thickness with the proper amount of retarder in it. 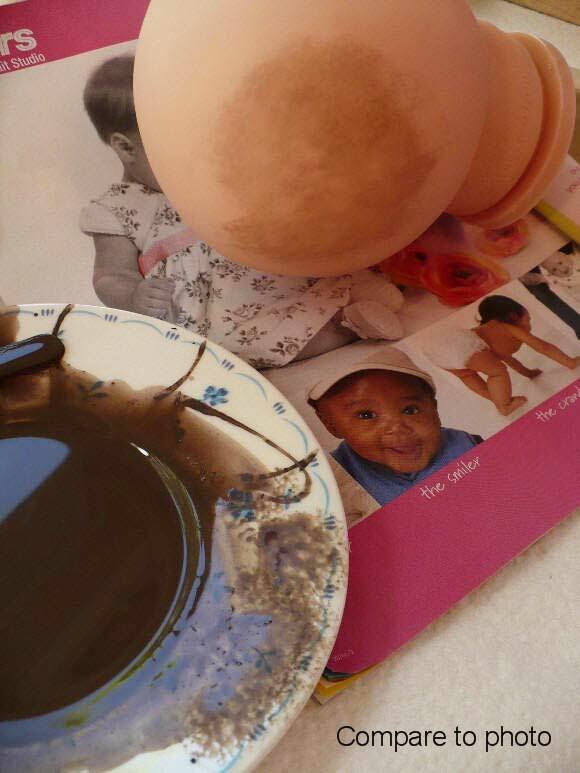 It is helpful to have a photo of a real Ethnic colored baby to help you blend colors. I am happy with this first color coat. Color you head using your chosen method, be it sponges (my preference) or brushes. 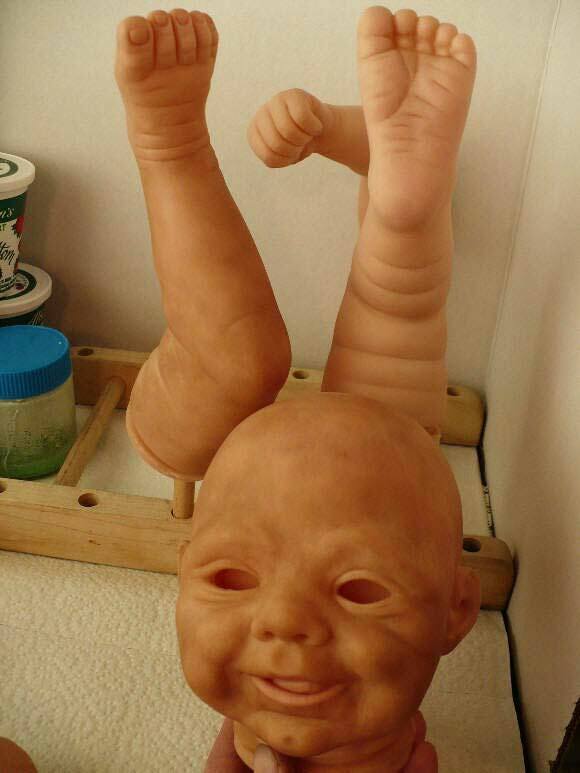 Just barely stain the bottoms of the feet and the palms of the hands and keep this layer of paint out from between the fingers and toes. We want to keep these light. 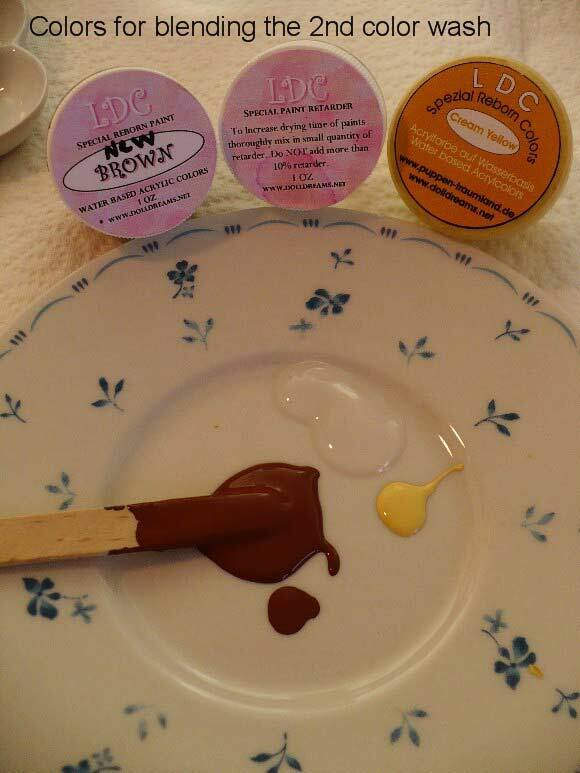 For the second wash, blend New Brown and a good amount of Cream Yellow (more than what is shown in this picture). Don’t forget the retarder, Matte base and water! Do not use this wash on the bottom of the feet nor the palms of the hands, we will cover that in the next section. 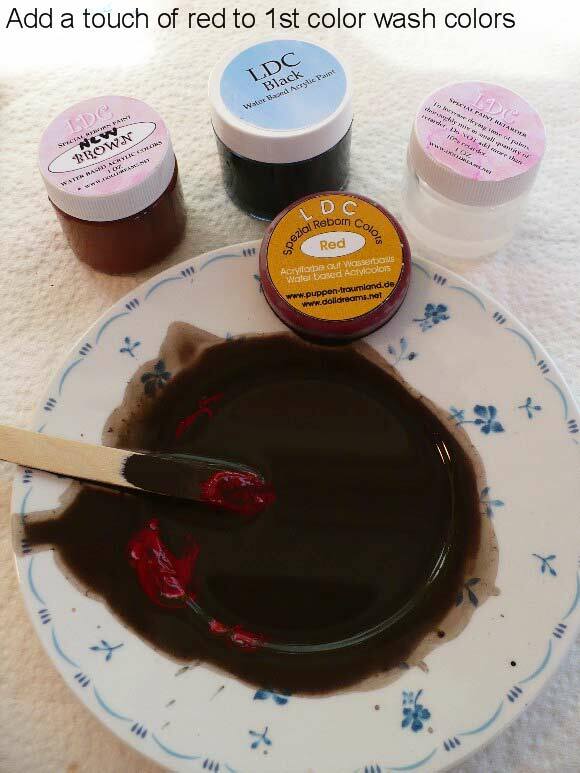 As you work on the second color wash/coat, you can begin your work on the lips using Dark Antique Rose for this first layer. Use burgundy to stain the tongue. Also coat the finger and toe nails with a thinned burgundy. You may coat the nails twice in the same setting with the thin burgundy. You will continue to build up colors on the mouth and lips as you progress. Add more color and detail to the lips with a combination of Black and Red combined, Antique Rose and Black combined while adding the Ivory color mentioned above in the Caucasian tutorial for 3-D details like taste buds. The nails will be tipped later. For all those lighter areas~the bottoms of the feet, between the toes, palms of the hands and between the fingers~ mix up a blend of Rose and a touch of Antique Rose, Retarder, Base Matte and water. 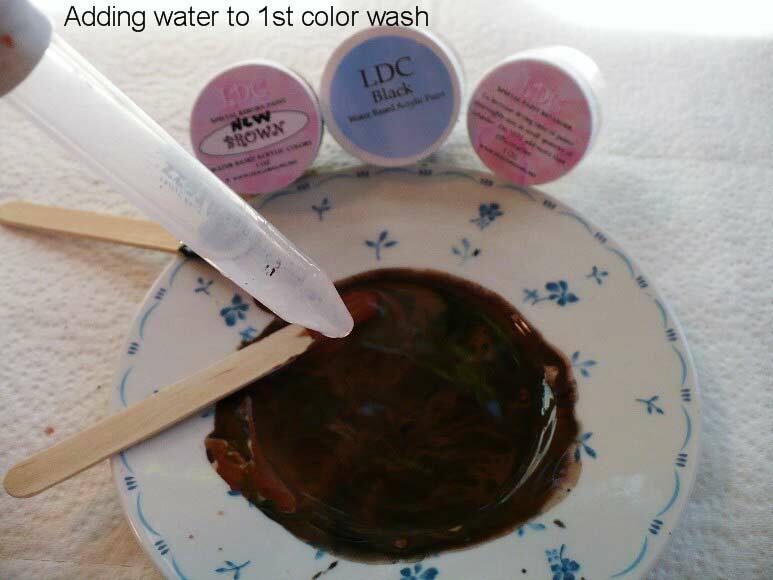 Pounce this on all those parts, blending into the darker colors already applied to your doll. During this stage, you can “moon” and “tip” those nails with the same ivory color that is used in the Caucasian tutorial. For the folds and creases, use the 1st color coat. 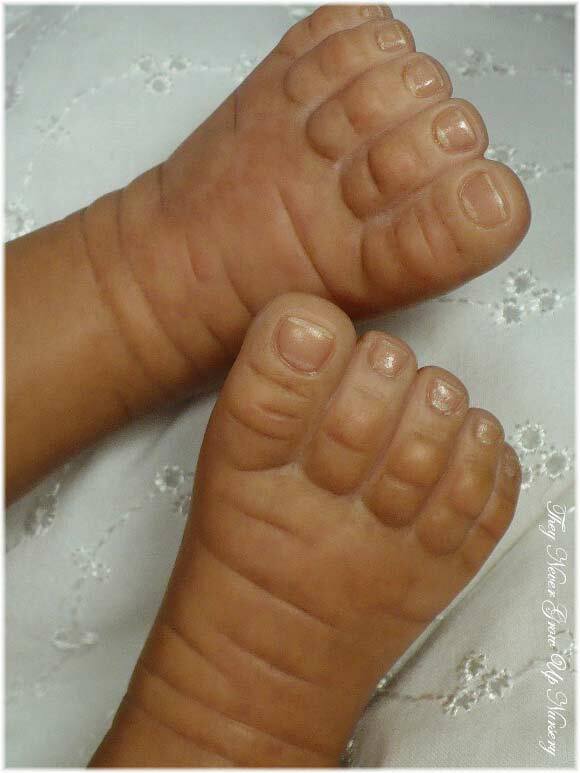 Ethnic babies have a lot of dark color in those area’s so don’t be afraid to pile it on! 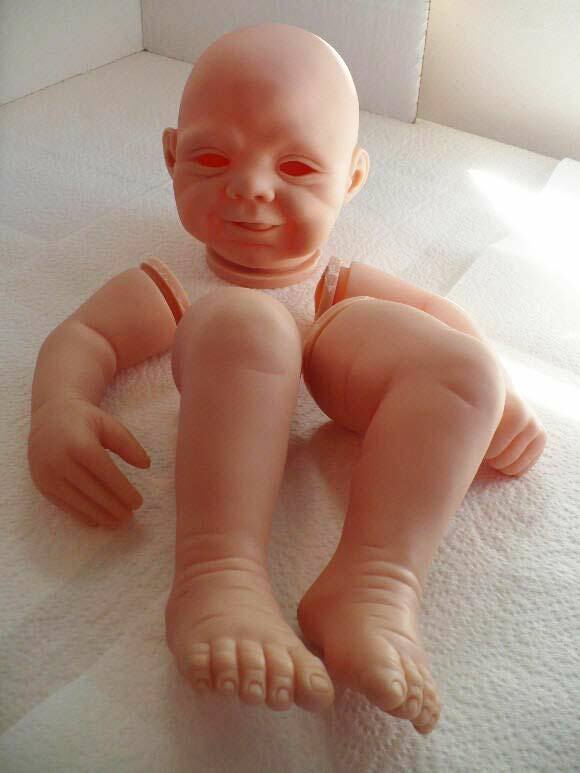 At this time, re-apply the rose colors to the lighter area’s of the doll (bottoms of feet etc). Touch up creases and folds with the 1st color coat with a bit of black added. Now for the 1st blush! We are getting very close to finishing our beautiful Ethnic baby! 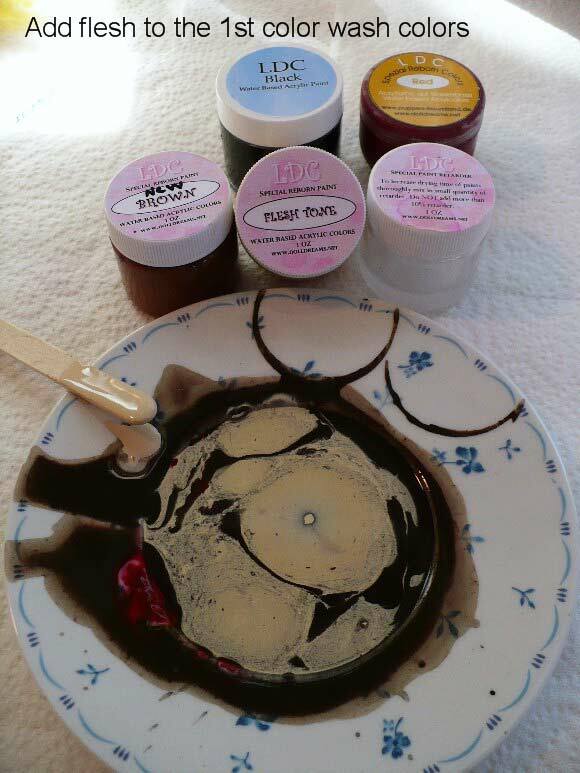 For this blushing, combine Antique Rose and Black to some of the 1st color wash blend. Add a dab of blue to all of this. 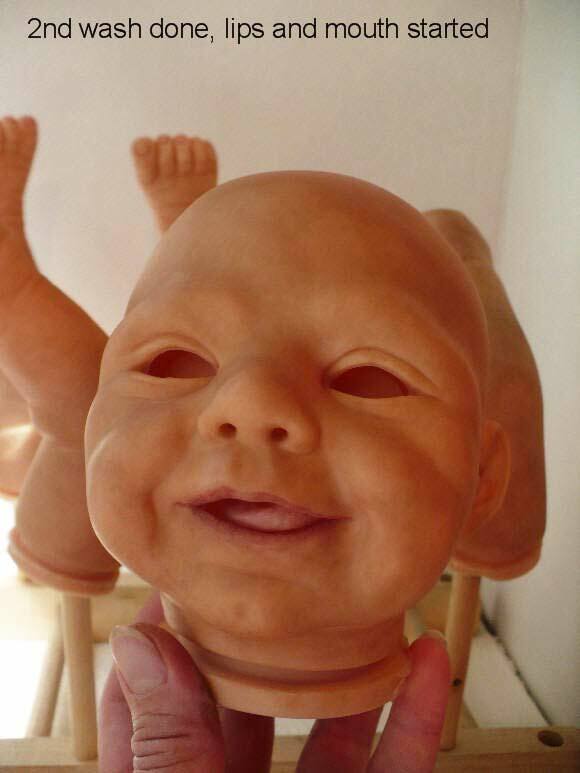 Blush your baby in all the high spots such as the top of the fat rolls, bottoms of the feet in the high places, the face cheeks, forehead, ears, top of the head and any other place you seem fitting. Now mix up a second color for a second blush. Use the first blush mix and add more Antique Rose. Re-blush where desired. 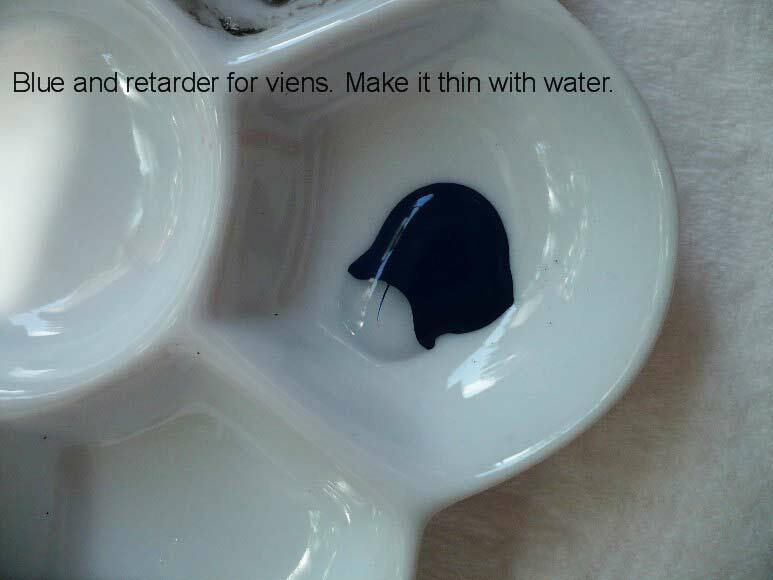 For the veins, mix up Blue, retarder, Base Matte and LOTS of water. Make this very thin. 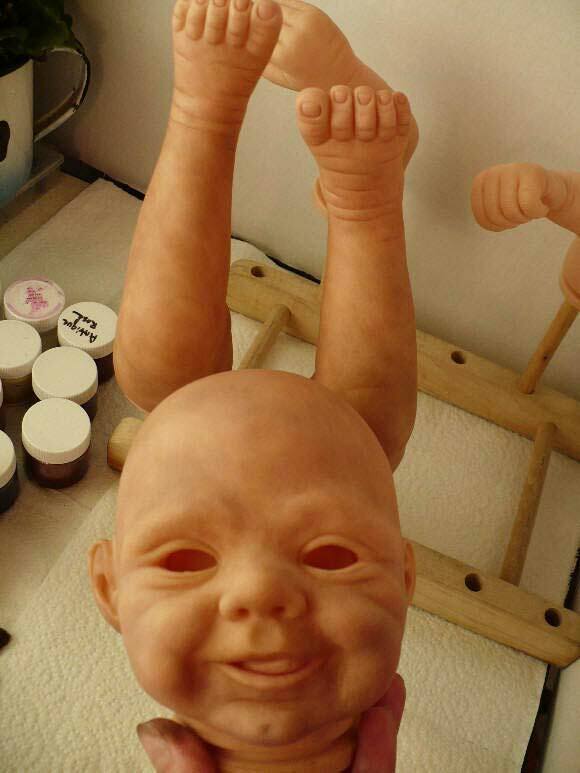 Dab on your veins with a brush and pounce in with a damp sponge. Now you can add final touches like eye brows and touch up any areas that are not satisfactory for you. When the paint has had time to cure (At least 24 hours in a 70 degree room) you may gloss the nails and fill the limbs with your choice of fillings. While they are drying (if you use glue to seal them) you may begin rooting. 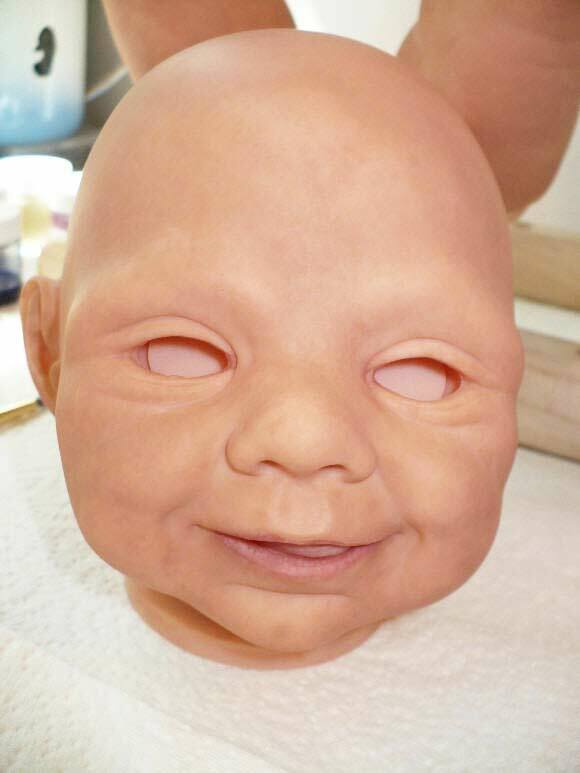 Here are some pics of this baby all finished with Eyes, lashes, body, weight, glossing and hair.